New construction is a rare sight on the historic Charleston peninsula. When the opportunity arises to build on scarce vacant land, there is also the opportunity to incorporate sustainable practices and modern technology to minimize our built environment’s impact on the natural one. In the coastal city of Charleston, perhaps the most important element of the built environment is the management of stormwater – the rainwater that would otherwise be absorbed into marshes are instead collected by building and street gutters and fed into the drainage system, which can become overwhelmed and lead to flooding, particularly during a high tide. Thoughtful approaches to building design can change that. A new development of six row houses in Harleston Village is introducing some exciting elements of architecture and technology that promises to impress. This latest collaboration between developer Jeffrey Roberts and architect Julia F. Martin – christened Harleston Row – brings a contemporary flare while honoring the character of the historic peninsula neighborhood. Among a number of sustainable materials and practices incorporated in this project, the solutions for water management feature a magnificent living roof. Incorporating a green roof into the design of a building expands the usefulness of that space, creating a new level of livability with gardens and patio decks. In a city with many beautiful vistas such as in Charleston, that rooftop green space can provide spectacular views of the city’s skyline and waterways. There is also ample evidence that the integration of natural elements into the home can boost productivity, creativity, healthfulness, and relaxation. Nestled in the heart of the downtown borough of Harleston Village, six new rowhomes are under construction along Gadsden Street. Located within walking distance of Colonial Lake, City Marina, and MUSC, these homes have a great location for enjoying the best that Charleston has to offer. Each three-bedroom, contemporary-design residence features an open floor plan, a custom high-end kitchen, and spacious bedrooms with ensuite baths. 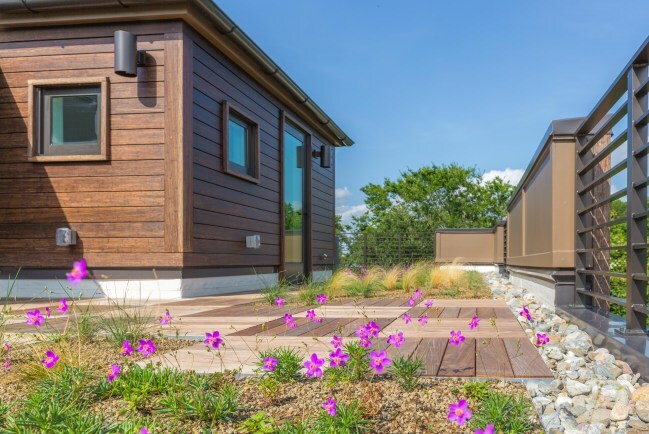 These beautiful high performance homes have been designed with materials of the highest quality, including Nichiha Architectural Block panels, Rainclad Bamboo siding, and Andersen impact-resistant windows. 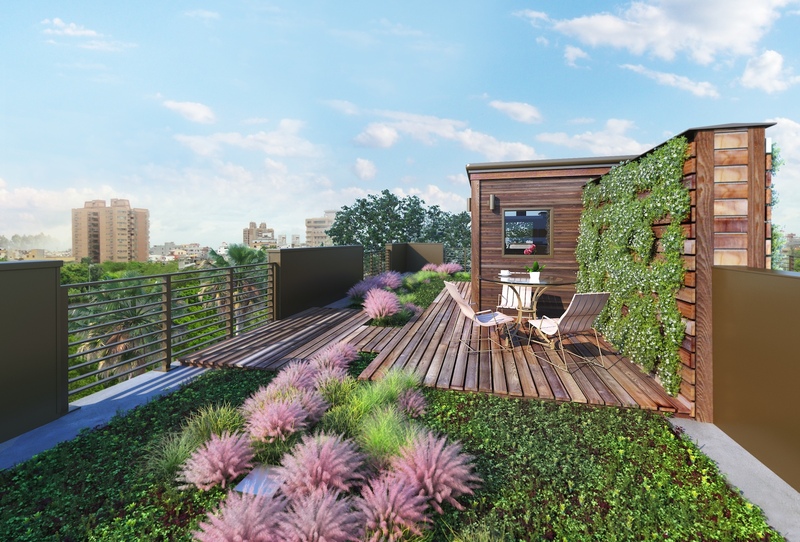 Crowning each rowhome, a rooftop office leading out to a living roof, featuring ample deck space for outdoor enjoyment. With their positioning on the west side of the peninsula, the rooftops of Harleston Row present the perfect opportunity to create an exclusive retreat with commanding views of the city. Anchored by an indoor study and sizable deck, these rooftop patios offer a perfect vista for watching the sun set over the Ashley River. For more information and to check the progress of Harleston Row, check out my colleague Kristin Walker’s website at http://harlestonrow.com.